Search engines continuously aim to give users better search experiences with every update. And with every search engine algorithm evolution, SEO must evolve with it. The latest evolution of SEO is the “topic cluster” model. The gist of the new model is this: the Google algorithm now favours “topic-based” content instead of the old “keyword-based” content. What does this mean for you and your website? Keep reading to understand in full depth how this new algorithm evolution affects your organic rankings and how to optimise your site accordingly. What is the Topic Cluster Model of SEO? The topic cluster model in its essence requires specific content such as blog posts to be “clustered” around a single broad topic located in a “pillar” page. This way, search engines such as Google can collectively assess your website’s relevance and credibility on any specific topic in an organised and straightforward manner. 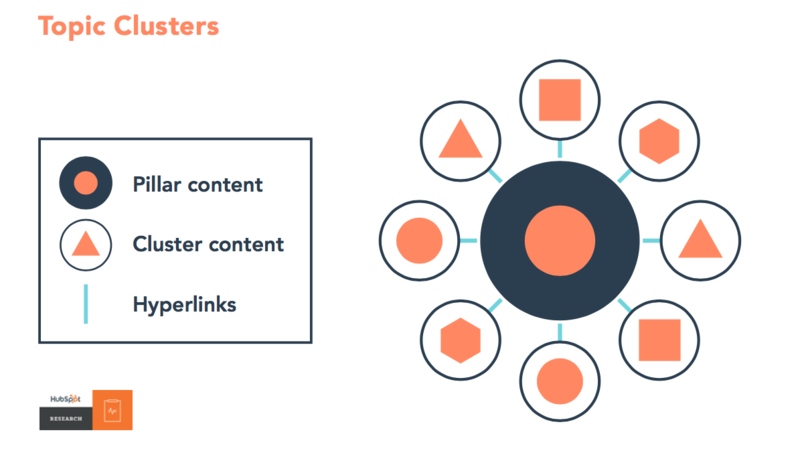 In this image, the cluster content (orange shapes) represents individual blog posts or subpages that are related (and linked) to a single pillar page that discusses the broader topic in more detail. For example, a pillar page about a broad topic like “small business SEO” would be linked to individual blog posts about specific aspects of small business SEO. This way, you demonstrate to Google that your website is an authority on that broad topic. Your pillar page is your core topic page. The content on this page should be broad and only scratch the surface of your topic. Pillar page content is long-lasting and evergreen, which means you should include general information that won’t expire over time and make the necessary updates when required. Optimise your pillar page content to answer broad questions about your main topic so all your visitors can get most of the basic information. Search is quickly becoming more conversational with Siri and Google Assistant, so always think about solving people’s problems and maximising reader value. Site visitors can then find more specific information through cluster content if they choose to do so. Cluster content is any specific content (such as blog posts) that relate to your main topic/pillar page. These support the bigger pillar page, and must only talk about one specific topic in depth. Where a pillar page contains a broad head keyword, a piece of cluster content focuses on long-tail specific keywords. There should be 20-30 cluster pages pointing to one specific pillar page. This is enough to build a broad umbrella of information without overcrowding your website. As in the infographic, hyperlinks act as the links between a piece of cluster content and its pillar page. Think of them as branches that connect the individual leaves to the tree’s trunk. Every cluster page should link to the pillar page at least once. The most important thing to remember about these cluster content hyperlinks is that they have to be the same anchor text. This is so a search engine recognises these posts as part of one topic cluster. Clearly define your topic cluster. Make sure your topic clusters are all related to each other and support the pillar page. This makes it easier to organise your content, as well as help search engines realise that there is a semantic relationship between them. Cluster pages should only link to each other and the pillar page. These internal links are valuable because they point to each other, telling search engines that all your cluster content is about the same thing. Additionally, this helps users stay longer on your site, as links provide easy access to relevant information that continues the user learning process. Remove other internal links not related to this cluster. Consolidate content overlap. Since there is a limit to the number of content pages you can have for one topic cluster, it is vital to separate and condense all the information and make sure there are no overlaps. Duplicate, similar and even outdated posts should either be condensed into one cluster page or redirected to a new one. Historical Optimisation. Although it might sound somewhat counter-intuitive, search engines actually consider both link freshness and link age. Older posts that are doing well on SERPs should be updated and republished under the same URL. Fill content gaps. One broad topic can branch out into more specific ones, so own that entire space of information. This gives a signal of your website’s breadth and authority on the topic to search engines. Once you have optimised your site under this model, track your pillar page strength and its supporting URLs using metrics such as volume traffic, relative rank and click-through rate. This will help you can create purposeful content that supports pillar pages and help your website rank on SERPs. Download our SEO e-book for more information on achieving online success with simple and effective SEO!